The Bills placed Murphy (elbow) on injured reserve Tuesday, Matthew Fairburn of The Athletic reports. Analysis: Murphy was knocked out of Sunday's 14-13 win against the Lions with a dislocated elbow, an injury that coach Sean McDermott said he may be able to play with, according to Fairburn. That will not come to pass, though. 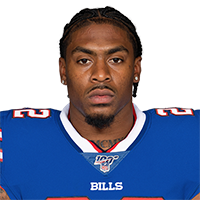 With LeSean McCoy (hamstring) and Chris Ivory (shoulder) also tending to health concerns, Keith Ford is left as the Bills' sole able-bodied back. Expect the team to be in the market for a free-agent signing at the position. Coach Sean McDermott said Murphy may be able to play with a dislocated elbow, Matthew Fairburn of The Athletic reports. Analysis: Murphy didn't play through the injury in Sunday's 14-13 win over the Lions, taking 11 carries for 35 yards before handing the backfield over to Keith Ford. The Bills are still in the process of figuring out if Murphy will be able to play Week 16 in New England, though it won't make much difference if LeSean McCoy (hamstring) and Chris Ivory (shoulder) are available. McCoy and Ivory both missed Sunday's victory, allowing Murphy to operate as the lead back in the first half. Murphy dislocated his elbow during Sunday's 14-13 win over the Lions, Ian Rapoport of NFL Network reports. Analysis: Prior to being forced out of Sunday's game, Murphy logged 11 carries for 35 yards. Once he was hurt, the Bills were forced to turn their backfield duties over to Keith Ford (14 carries for 46 yards and one catch for seven yards), with LeSean McCoy (hamstring) and Chris Ivory (shoulder) both inactive. With Murphy's Week 16 status now unclear, look for the Bills to add running back depth in short order. Murphy was forced out of Sunday's game against the Lions with an arm injury, Chris Brown of the Bills' official site reports. Analysis: With Murphy injured and both LeSean McCoy (hamstring) and Chris Ivory (shoulder) inactive, Keith Ford is the last man standing among the Bills' running backs Sunday. Murphy is listed as the projected starter in the Buffalo backfield Sunday against Detroit, as both LeSean McCoy (hamstring) and Chris Ivory (shoulder) are inactive for the contest. Murphy could serve as the Bills' top option out of the backfield Sunday against the Lions with both LeSean McCoy (hamstring) and Chris Ivory (shoulder) listed as questionable and both at risk of missing the contest, Adam Schefter of ESPN reports. Murphy rushed four times for 10 yards while catching his lone target for eight more in Sunday's 27-23 loss to the Jets. Analysis: Murphy didn't do much with his opportunities after both LeSean McCoy (hamstring) and Chris Ivory (shoulder) exited due to their respective injuries. In fact, wide receiver Isaiah McKenzie was more productive as a rusher than Murphy, turning four carries into 22 yards and a touchdown. Should McCoy and Ivory sit out in Week 15, Murphy would become Buffalo's primary rushing option against the Lions. Murphy had a seven-yard carry during Sunday's 21-17 loss to Miami. Murphy rushed 14 times for 69 yards and wasn't targeted in the passing game during Sunday's 41-10 win over the Jets. Analysis: Murphy benefited from a perfect storm of opportunity, as Chris Ivory's shoulder injury cleared out the backup running back role, and game script called for plenty of rushing attempts with Buffalo sitting on a big lead. LeSean McCoy rushed 26 times, so Murphy was the clear-cut No. 2 despite his volume. He may not get another workload as large as this one the rest of the way after the Week 11 bye. Murphy is one of only two active running backs for the Bills Sunday against the Jets, Chris Brown of the Bills' official site reports. Murphy rushed one time for six yards and caught three passes for minus-7 yards during Sunday's loss to the Bears. 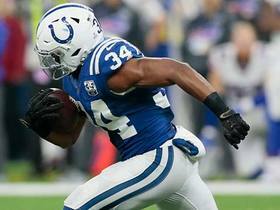 Murphy logged four carries for 53 yards and added five catches (on six targets) for 17 yards in Sunday's 37-5 loss to the Colts. Analysis: Murphy's profile in the Buffalo offense expanded Sunday after LeSean McCoy exited the game with a concussion. Once that occurred, Chris Ivory served as the team's lead back, with Murphy working in a change-of-pace role. After the game, it was reported that Ivory is dealing with an unspecified injury, which he downplayed. Considering that, as well as McCoy being in the NFL's concussion protocol, Murphy is a player to track as next Monday's game against the Patriots approaches. Murphy is in line for added touches Sunday against the Colts, with LeSean McCoy being evaluated for a head injury. Analysis: With McCoy in the locker room and iffy to return to Sunday's contest, the Bills' Week 7 backfield duties will now be handled by Chris Ivory and Murphy. 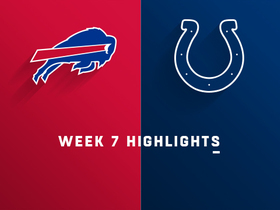 Murphy is active for this week's game against the Colts, the Bills' official site reports. Analysis: Murphy isn't in line to see a lot of carries, but after being a healthy scratch the past two games, he could handle some return duties with Ray-Ray McCloud inactive. Murphy could dress as the Bills' No. 3 running back Sunday against the Colts with teammate Taiwan Jones (neck) ruled out for the contest. Analysis: Murphy hasn't suited up in the last three games, with one absence coming due to injury and the other two coming as a healthy inactive. Jones' absence could create an opportunity for Murphy to re-enter the fray as a depth running back and option in the return game. So long as both LeSean McCoy and Chris Ivory are healthy, however, Murphy won't see more than a few carries if he plays Sunday. Murphy is inactive for Sunday's game in Houston, Chris Brown of the Bills' official site reports. Analysis: This will make three straight missed games for the previously promising fantasy hopeful, with one absence due to injury and two to healthy scratches. With LeSean McCoy and Chris Ivory both healthy and Taiwan Jones a better special teams option, Murphy has taken a back seat in the team's plans for now. Murphy will not suit up for Sunday's game against the Titans, Chris Brown of the Bills' official site reports. Analysis: Murphy appears mostly healthy after dealing with a rib injury recently, but apparently the Bills feel comfortable with LeSean McCoy, Chris Ivory and Taiwan Jones manning their backfield this week. Murphy has been dropkicked after having a brief window of value earlier this season when McCoy was out with an injury, but Ivory has retaken the No. 2 spot and Jones is a more well-rounded special teams player. Murphy (ribs) practiced fully Friday for the third straight day and doesn't appear on the Bills' injury report for Sunday's game against the Titans. Analysis: Murphy sat out the Week 4 loss to the Packers, but he'll be available in a reserve role for Sunday's contest. With LeSean McCoy and Chris Ivory both relatively healthy and ahead of him of the depth chart, expect Murphy's touches to be relatively scarce. He could factor into the return game, however. Murphy, who missed Sunday's 22-0 loss to the Packers with a rib injury, turned in a full practice Wednesday, Chris Brown of the Bills' official site reports. Analysis: It looks like Murphy will be back in the mix for Sunday's game against the Titans, but with LeSean McCoy and Chris Ivory mostly healthy he'll likely be limited primarily to a special teams role. Coach Sean McDermott expects Murphy (ribs) to be fine moving forward, Mike Rodak of ESPN.com reports. Analysis: Murphy was held out of Sunday's 22-0 loss to the Packers after logging limited practices throughout the week. He seems to be on track for a return Week 5 against the Titans, but his role on offense likely will be limited now that the Bills have LeSean McCoy (hand, ribs) available. Murphy (ribs) is listed as inactive Sunday against Green Bay. Analysis: Despite logging limited practices all week, Murphy will take a seat from his role as a reserve running back and occasional kick returner. The return of LeSean McCoy (ribs) likely made this an easier decision for the Bills, who also have Chris Ivory on hand to serve in a backup capacity. Murphy (ribs) is listed as questionable for Sunday's game at Green Bay. Analysis: Murphy was a limited participant at practice this week to earn the questionable tag, along with starting RB LeSean McCoy. If Murphy is able to suit up Sunday, his potential value will largely hinge on McCoy's status, though Chris Ivory is still ahead of him on the depth chart and saw the bulk of the touches (23 to nine) in Week 3 when McCoy was out. Murphy (ribs) was spotted in a non-contact jersey during the portion of Thursday's practice that was available to the media, Mike Rodak of ESPN.com reports. Bills head coach Sean McDermott said Wednesday that Murphy is dealing with a rib injury, Vic Carucci of The Buffalo News reports. Murphy will be a limited participant in the Bills' first practice of Week 4, according to Matthew Fairburn of The Athletic. Murphy carried eight times for 33 yards and caught his only target for an additional yard during Sunday's 27-6 win over the Vikings. Murphy could be in line for an expanded role Week 3 with LeSean McCoy (ribs) inactive, though Mike Rodak of ESPN.com reports that Chris Ivory will draw the start. Murphy rushed three times for six yards and caught just one of five targets for seven yards during Sunday's loss to the Chargers. Analysis: Murphy had seemingly passed Chris Ivory for No. 2 duties and even though he got three carries to Ivory's two, it was Ivory who got the goal-line plunge for Buffalo's only rushing score, while the former Jaguar was also involved in the passing game just like Murphy. There will be some guesswork involved if starter LeSean McCoy misses some time to a rib injury suffered Sunday, though the early word is Shady will try to play through the issue. Murphy ran for 31 yards on six carries during Sunday's 47-3 loss to the Ravens. Analysis: It was a solid, but unspectacular, season debut for Murphy. How much stock do you put into a game that was over so early? One thing to look out for is this: both quarterbacks need a security blanket. That might mean that Shady McCoy gets more involved in the passing game and his backup gets more carries as he rests up. Monitor Buffalo's depth chart. Murphy seems to have surpassed Chris Ivory as the Bills' No. 2 running back on the depth chart, Joe Buscaglia of WKBW.com reports. Murphy rushed 11 times for 58 yards and caught both of his targets for seven more in Sunday's 26-13 preseason loss to the Bengals. Analysis: Murphy hasn't made much of a name for himself since being selected in the seventh round of the 2015 draft by the Saints, but he's pretty much a lock to make Buffalo's roster and looked excellent once again Sunday. If LeSean McCoy's (hip/groin) recovery spills into the regular season, Murphy's primary competition for touches would be injury-prone veteran Chris Ivory. Murphy gained 39 yards on four carries and 39 yards on one punt return in Friday's preseason game against the Browns. Analysis: He did drop his only target but otherwise had a fantastic night. ESPN.com's Mike Rodak believes Murphy could push Chris Ivory for the No. 2 running back job, and WKBW's Joe Buscaglia thinks the 26-year-old has already earned his spot on the 53-man roster. Murphy will try to strengthen his case next Sunday against the Bengals. 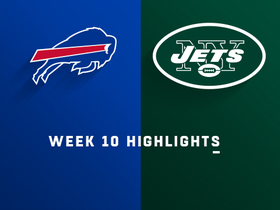 Murphy carried seven times for 35 yards and caught four passes for 30 yards in Thursday's preseason opener, scoring one of the Bills' three touchdowns on a seven-yard run. Murphy's teammate LeSean McCoy (ankle) is active for Sunday's playoff game in Jacksonville. Analysis: McCoy is far from 100 percent, so there's still a chance he can't gut it through the entire game and a number of carries and short catches end up falling to Murphy, who totaled 48 yards from scrimmage in Week 17. However, given that Mike Tolbert is also in the mix and that McCoy plans to give it a full go, Murphy's role is more likely to be minimal. Murphy is poised for a larger workload Sunday at Jacksonville with LeSean McCoy's (ankle) status up in the air, Sal Maiorana of the Rochester Democrat and Chronicle reports. Analysis: Murphy has spent less than two months in the Bills organization, but his promotion to the 53-man roster before Week 17 could soon pay significant dividends. 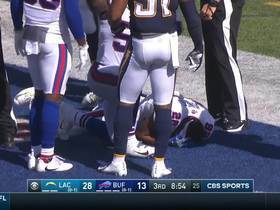 Granted, McCoy is considered a "game-time decision" due to his ankle injury, per Adam Schefter of ESPN, but the multiple Pro Bowler missed Wednesday's practice. After McCoy was knocked out Week 17, Murphy proceeded to split work with Mike Tolbert, both of whom received seven carries and two targets by the end of the game. Murphy rushed seven times for 41 yards and brought in both of his targets for seven yards in Sunday's 22-16 win over the Dolphins. The Bills promoted Murphy from the practice squad Tuesday, Joe Buscaglia of WKBW.com reports. Analysis: Murphy joined the Bills' practice squad in early November and could dress for the club in Sunday's regular-season finale against the Dolphins after third-string back Travaris Cadet (ankle) was placed on injured reserve. If Murphy suits up in Week 17, expect him to see most of his action on special teams. 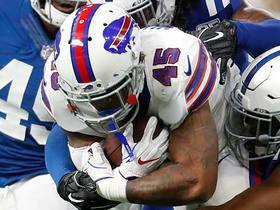 Murphy signed with the Bills' practice squad Monday, Chris Brown of the Bills' official site reports. Analysis: Murphy has previously had stints on the Colts' and Jets' practice squads this season. The Bills are lacking in depth at running back after Taiwan Jones (arm) was moved to injured reserve following the team's Week 9 loss to the Jets, but Murphy will likely need another injury to one of LeSean McCoy, Mike Tolbert or Travaris Cadet before earning a promotion to Buffalo's 53-man roster. 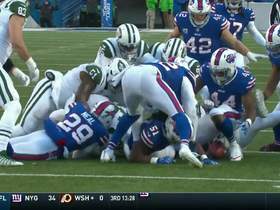 New York Jets wide receiver Andre Roberts fumbles and Buffalo Bills fullback Patrick DiMarco recovers. 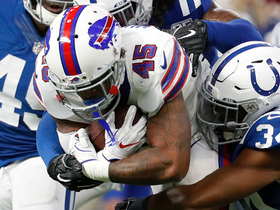 Buffalo Bills running back Marcus Murphy rushes for a 30-yard gain against the Indianapolis Colts for Week 7 of the 2018 season. 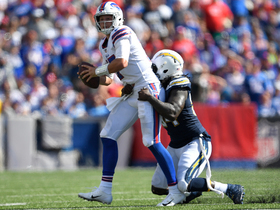 Los Angeles Chargers defensive end Melvin Ingram drags down Buffalo Bills quarterback Josh Allen to force an interception caught by Los Angeles Chargers safety Adrian Phillips. 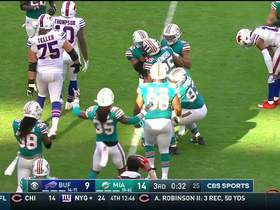 The Chargers punt the ball away, but Buffalo fumbles and recovers for a touchback, and Uchenna Nwosu gets flagged on the play for unnecessary roughness.